According to the Cedar Mountain Herb School, paper birch leaves and twigs can be boiled and used as an anti-inflammatory. Birch twigs and leaves contain Betulinic acid, a derivative of birch essential oil, which closely resembles wintergreen oil. Betulinic acid is most commonly used as an anti-inflammatory. Specifically, birch can be used to treat rheumatism, arthritis, gout, calcium spurs, heart and kidney edema, chronic cystitis, colds, coughs and high cholesterol. One of the most common ways to use birch as an anti-inflammatory is to take bark, twigs and dried leaves and make a tea that can be taken as needed. John K. Crellin, author of "Home Medicine: The Newfoundland Experience," suggests that the inner bark of the paper birch tree can be used to treat frostbite and burns. In addition to providing skin-soothing elements, the tree sap also contains pain relievers, which, once applied, may eliminate some of the discomfort associated with both ailments. In addition to providing relief for frostbite and burns, birch poultices are also used to treat skin abrasions and eczema. To make a poultice, strip the bark and mash it until the juices are able to saturate the bark pulp. Strips of the bark can also be layered over burns and frostbite to treat them. In addition, juices from the birch bark can be used to treat acne and blemishes. Birch bark and leaves both contain diuretic properties. Diuretics work by ridding the body of excess salt and water. This can help reduce blood pressure, as well as reduce discomfort associated with glaucoma and edema. In addition birch bark is used to treat urinary tract infections by removing water from the body and providing a constant flow through the urinary tract and flushing out infection. Caution should be used when taking birch as a diuretic to avoid dehydration. If drinking a birch bark tea, be sure to incorporate other fluids into your diet. 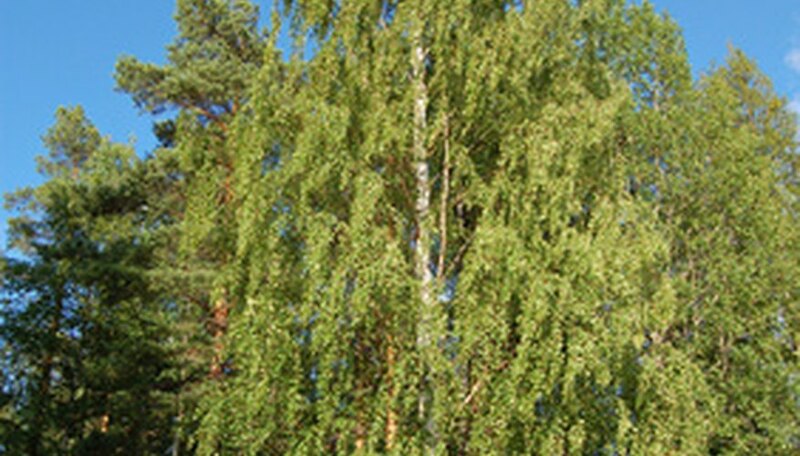 Only the leaves and leaf buds of the birch tree contain antibacterial properties. Leaves can be crushed and made into a poultice or boiled to extract the antibacterial oil. Another common way in which birch tree leaves are used for antibacterial purposes is to boil the leaves and make tea. Leaves can be either fresh or dried. How Do I Stop a Birch Tree From Leaching? Are Weeping Willow Trees Good Firewood? What Are the Dangers of Sambucus Nigra? What Are the Dangers of Sassafras Tea? What Pine Trees Are Poisonous?